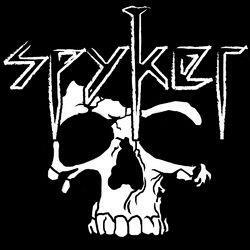 Spyker is a young thrashcore metal band from the Netherlands formed early 2009. Spyker combines Thrashmetal and Metalcore to make a powerful mixture of blastbeats, grunts, breakdowns, but also smooth melodic guitar parts and raw vocaling. Late february 2010 Spyker recorded their first EP at Sing Sing Studios. “Spyker – Sacred Rage”. The EP includes three songs; “Endtimes”, “Goat, Bloody Goat” and “Sacred Rage”. It also includes the official videoclip for “Endtimes”. After a period of performing, testing their songs to the audience and getting musically comfortable with one another, Spyker wrote a whole new set of slick sounding songs with sometimes extracurricular themes. At the moment Spyker is busy planning their first full length album, which will appear somewhere spring 2012. Keep an eye out for their name because Spyker is far from done kickin the crap out of all the socially accepted, media promoted, indoctrinated bull that we have to put up with every single day. Spyker already played main stage gigs like: Tattoofest and Frisian Metal Night. At venues like: Metal Front Coevorden, Poppodium Romein, Iduna, Metal Front Nijverdal.